Fig. 1. 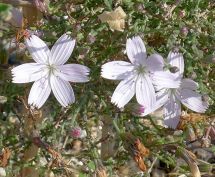 Left: a late-blooming Stephanomeria exigua ssp. 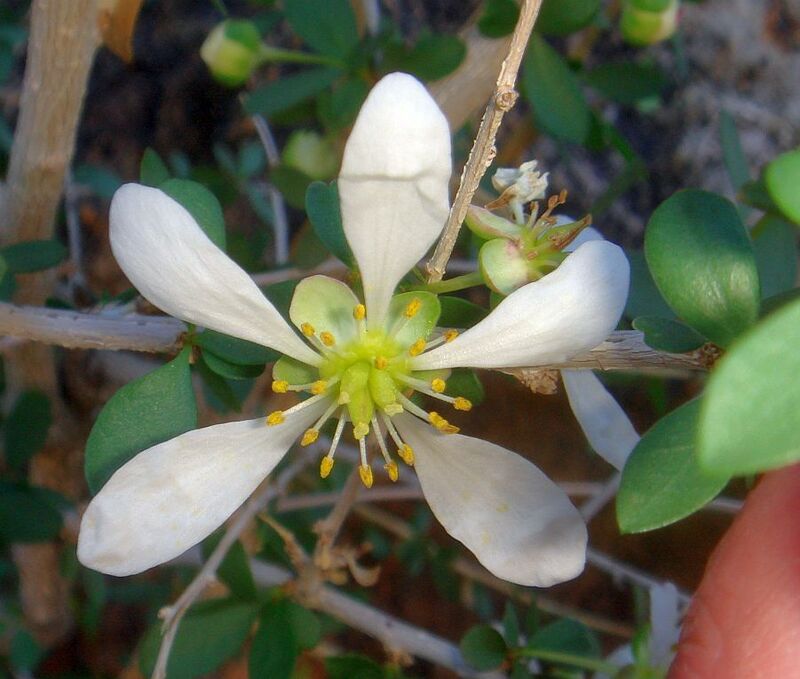 exigua, slender wreathplant that had been munched, and was growing in an unusually-dense form. Right: Part of a huge almost-monoculture of Encelia farinosa, brittlebush, where the plants are either solidly dead, or thriving. The vast majority of the seedlings forming the green masses on the ground are Schismus barbatus, Mediterranean schismus; Brassica tournefortii, Asian mustard; and Erodium cicutarium, redstem filaree, all non-natives. Pictures taken by Tom Chester on 8 January 2015 near the Cottonwood Trailhead. This section covers mile 214 to mile 221 from the Mexican Border (see notes on accuracy of mileages). Topo! gives 6.6 miles for this segment; the PCT Data Book gives 6.8 miles. We adopted 6.8 miles. 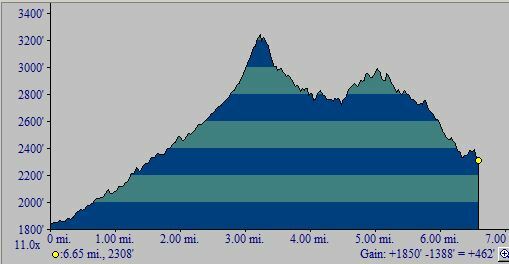 The one-way hike from south to north has a total elevation gain of 1790 feet; see the profile below. The one-way hike from north to south has a total elevation gain of 1340 feet. A round-trip hike of this section is 13.6 miles, with an elevation gain and loss of 3130 feet. The trail proceeds through Gold Canyon, a linear fault valley with bedrock to the north of the trail and alluvium to the south (containing some clasts as big as cars). As you approach the windmill farms, the trail makes a 90-degree turn to the north on another linear fault valley. When you reach the saddle, the shattered rock there is evident. Just on the other side of the saddle is the only known location of woolly yerba santa that grows in the range. 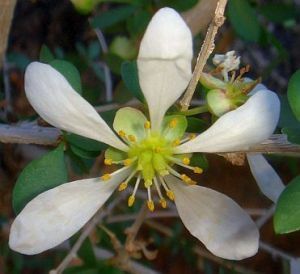 It is also very interesting that the other species of yerba santa grows with it. Shortly, you will enter the wilderness area that used to be a riot of wildflower until cattle were allowed to range here. Not only have the cattle destroyed the beautiful plant display, the grazing has seriously eroded the landscape. The trail then winds itself down a very plant diverse north-facing slope to Whitewater Canyon. Near the end is your first encounter with the rare plant, Crossosoma; see Fig. 2. 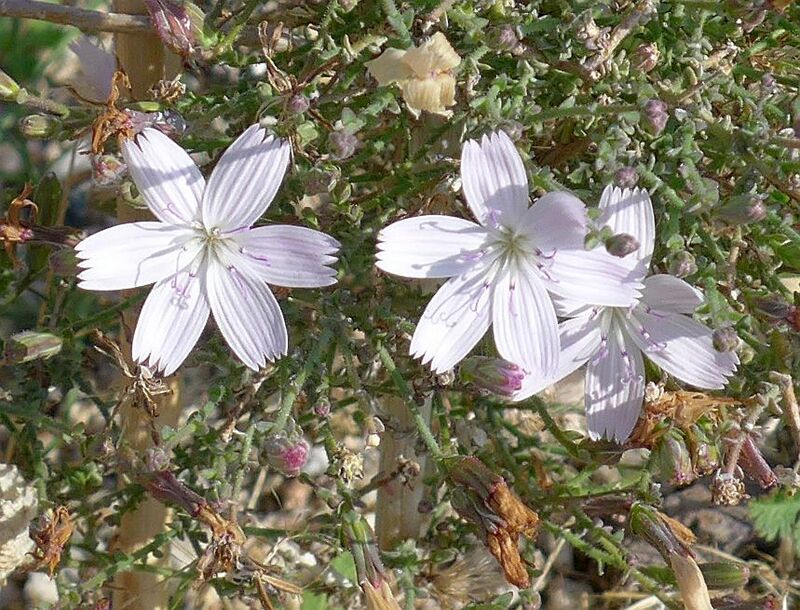 It is such a rare and unique plant that the Southern California Botanist society uses it for their logo and periodical name. Fig. 2. 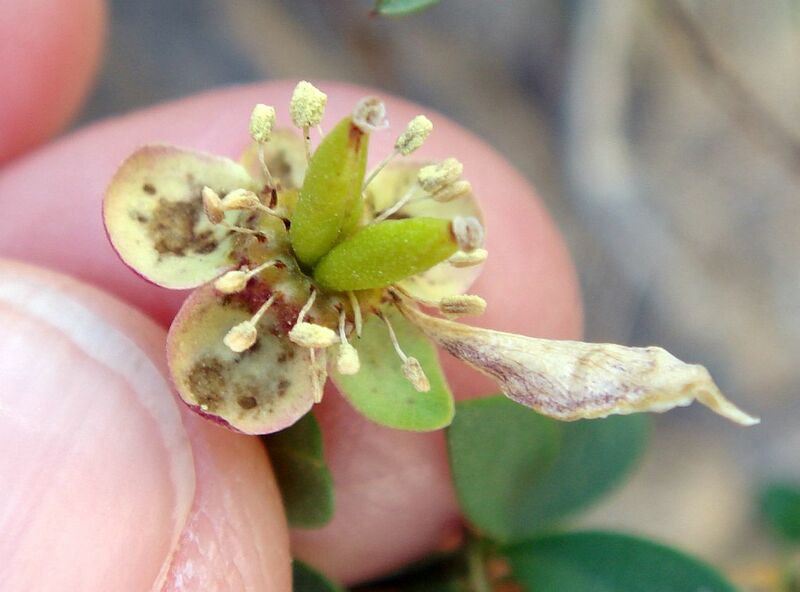 Left: Crossosoma flower from Borrego Palm Canyon, 28 January 2010. 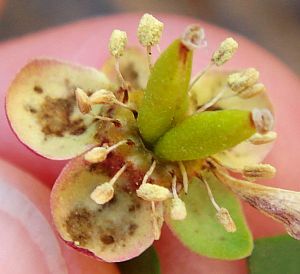 Right: Developing Crossosoma fruit from Henderson Canyon, 4 April 2009. Pictures taken in Anza-Borrego Desert State Park by Tom Chester. Click on the pictures for larger versions. Even though this area looks much like the adjoining Sonoran Desert, it is interesting which Sonoran Desert species are missing from this area. 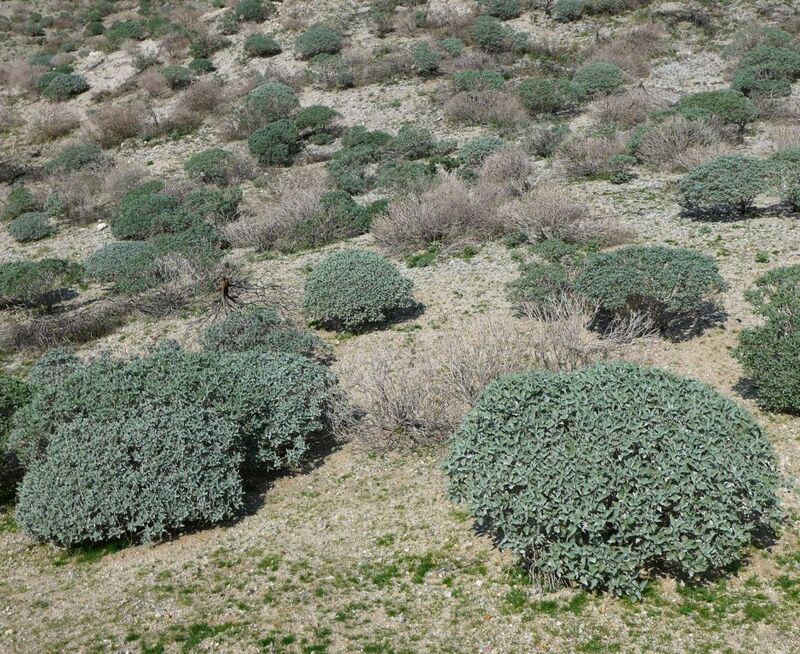 We were surprised not to see ocotillo, rock daisy (Perityle emoryi), teddy bear cholla, jojoba and chuparosa. It appears that all of these species don't like the elevations here; they are only found at lower elevations to the east. And despite Gander's cholla and Prunus fremontii being abundant at similar elevations south of I-10, we found none climbing up to the saddle. It appears that both of those species don't like something about the area north of Banning Pass. Fig. 3. 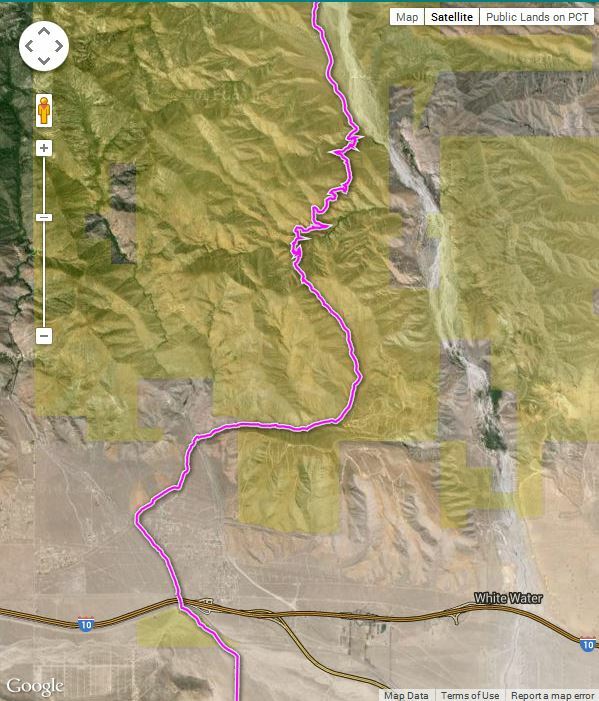 Left: Trail Map for the PCT Section C2 from the Cottonwood trailhead to Whitewater Canyon, from USDA Forest Service Interactive Map. 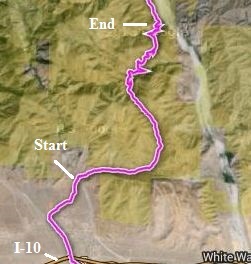 Right: Elevation profile from Cottonwood trailhead to Whitewater Canyon, from south to north. Click on the pictures for larger versions. Surveyed 3/24/2013 by RT and Shaun Hawke. On some parts of the trail, the plants were drought dormant (especially the beginning) while other areas were in full bloom. 122 species were observed. Surveyed 1/8/2015 by Tom Chester, RT Hawke, Adrienne Ballwey, Dave Stith, Tracy Albrecht and Heidi Schneck. Most plants were not in bloom, but there was good annual germination. 106 species were observed, including 18 species new to the list. Illustrated Family Order List from Calflora, with two thumbnail pictures for every species found on the trail (141 taxa). Note the checkbox at right that allows a sort of the list in family order instead of scientific name order, or a sort by bloom start month. Check Show photo service links and then click on Display to get links to all Calphotos et al pictures. We thank Heidi Schneck for help with the 8 January 2015 survey.